Bhagat Singh's name in real sense became symbol of Indian revolutionary movement like Lenin of Russian revolution. Britishers acknowledged his political inclination & perspective which became a stiff reason to hang him without a fair trail & justice. Bhagat Singh was an extremely well read man & his special sphere of study was Socialism. The batch of young men that figured in Lahore Conspiracy Case was essentially an intellectual one. But even in this group Bhagat Singh predominanted for his intellectual ascendancy. Though Socialism was his special subject, he had deeply studied the history of Russian revolutionary movement from its beginning in the early 19th century to the October Revolution of 1917. 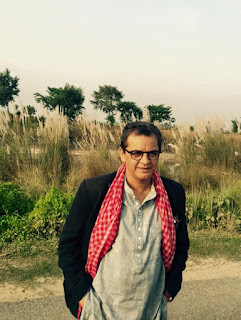 It is generally believed that very few in India could be compared to him in the knowledge of this special subject. The economic experiment in Russia under the Bolshevik regime also greatly interested him. 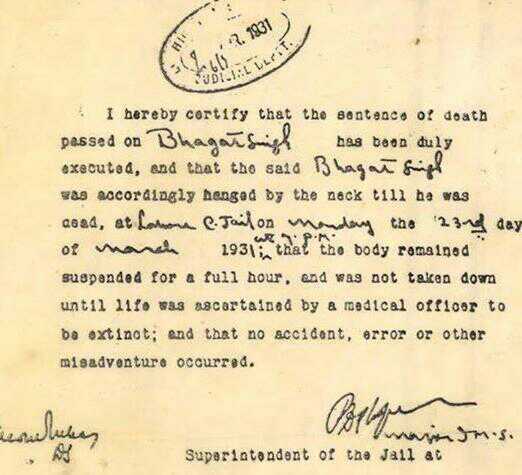 Here is photo of Bhagat Singh's death certificate. He was hanged in hurry by britishers, a day earlier his scheduled day in evening, 7 p.m, which was against protocol of hanging procedure.